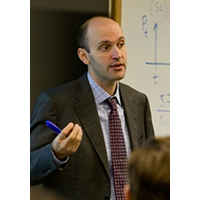 Nicholas C. Barberis is the Stephen & Camille Schramm Professor of Finance at the Yale School of Management. Professor Barberis’ research focuses on behavioral finance—in particular, on applications of cognitive psychology to understanding investor trading behavior and the pricing of financial assets. He has published extensively in the top economics and finance journals such as Journal of Political Economy, American Economic Review, Journal of Finance, Review of Financial Studies and the Journal of Financial Economics, gives frequent presentations about his work to both academic and non-academic audiences, and has won numerous awards for both research and teaching. Prior to coming to Yale, Professor Barberis taught at the Booth School of Business at the University of Chicago.